In this region we can see how modernity mixes with history, as Antigua Guatemala is an open-air museum and is architecturally beautiful. It is the heart of the city’s historic quarter. It was remodelled following the earthquake of 1976, having built an underground park and conserving the Parque Centenario. It is currently a meeting point for families and friends, especially on Saturdays and Sundays. It is surrounded by important monuments and buildings such as: The National Palace, the Metropolitan Cathedral, the Commerce Portal and the Centennial Park. A short distance away is the National Library, the newspaper archive and the General Archive of Central America. It was built between 1779 and 1815 and houses many artistic treasures that were originally found in the Cathedral of ancient Guatemala, has suffered the onslaught of three earthquakes, 1830, 1917 and 1976. It is important to observe the altars that are on both sides of the central nave, which still retain many of the images of saints, relics of the churches of ancient Guatemala when the city was moved. The altars contrast with the austerity of the construction in general. On one side is the archiepiscopal palace, home to the highest hierarchy where several church offices are currently operating. This cultural complex, designed by the engineer and artist Ephraim Recinos, is located in the Civic center of the city, built on the space that once occupied the fort of San Jose. Also known as the National Theatre. One of the attractions of the building is its shape, as it emulates a boat, which makes it stand out over the surrounding buildings. It consists of the Grand Theatre with 2.068 armchairs, chamber theatre, open-air theatre, squares, rehearsal rooms, workshops and conference rooms, as well as a museum of ancient weapons. Shows of various kinds are presented in different theatres to international conventions. On the façade, it is said that the engineer and artist Ephraim Recinos captured different forms of animals, objects and nature of Guatemala, which has fascinated several architects and people, who say they find tenths of figures in the surroundings of the facade. It’s located two from the airport. It occupies an area of 17 blocks of green areas and rest. In the center there is a banquet hall, known as the Tea House, which was built in the 1920s, French style, and Italian marble statues to the front. In the area of mammals, there are original Mayan stelae. In the African Savannah, Asian and tropical forest there are about 70 species of animals (700 animals) Some in danger of extinction, in open spaces, separated from the public by a moat and with a representative design of their animal. Most are tropical species of both animals and plants. It’s a delight for photographers and nature lovers. Address: Boulevard Juan Pablo II, Zona 13. Finca Nacional La Aurora. Timetable: Tuesday to Sunday from 9:00 to 17:00 hrs. The zoo in addition to being a tourist attraction within the city of Guatemala, helps to the conservation and research of species, since together with the Latin American Association of Zoos and Aquariums, it has the program of the Humboldt penguins, the Which they seek to reproduce and then re-introduce them into their natural habitat in Peru and Chile. This site was the great metropolis of the Altiplano, located in zone 7 of Capital City, Its occupation extends from the Preclassic to the beginnings of the Postclassic. In the past, it had more than 250 structures that survive around 30 days. The preserved area is referred to as the basin, its former Acropolis, while other mounds survive the destruction in isolation. The occupation of the site dates from the beginning of the pre-classic and to the Middle Preclassic. The ceramics of this place were exported to almost all regions of the Altiplano and to the south. In this area we can find the snake mound, which was an extensive high irrigation channel that reached 5 kilometers long, being the most extensive system in Mesoamerica. In the park we can see some structures discovered and covered, however the vast majority are still buried. It is located 45 kms from Guatemala city. It was the third capital established by the Spaniards. It was named city of Santiago of the Knights of Guatemala in 1566. After plagues, earthquakes and floods, the telluric movement of 1773 ended up destroying it definitively. Despite having been a outlawed and abandoned city to create a new capital, gradually its inhabitants returned to give life and today is one of the biggest tourist attractions in Guatemala. It is a jewel of urbanism and colonial architecture, which retains its characteristics, as if in them time had stopped. Due to its immense historical and cultural value, it was declared “World Heritage Site” by UNESCO in 1979. In the heart of the city, is located the main square within this traditional grilled path so used in the Spanish urban development in the time of the colony. The central square is surrounded by different monuments such as: The Palace of the general captains, the town hall, the church of San José formerly the Cathedral of Guatemala, the archiepiscopal Palace and the Commerce Portal. In the center of the square, you will find the iconic fountain of the Sirens. The Earl of La Gomera, built it in memory of the popular legend about a king whose daughters gave birth and did not want to breastfeed their little children, so he sent to be tied to a stick in the middle of a water eye , where they died of thirst and starvation. In the fountain, the four sirens hold their breasts in their hands, which provided water to the city. It was built in 1739 by Diego de Porres and has been constituted in one of the symbols that identify the old colonial city. The façade of this church is without doubt the best example of the Baroque style that prevailed in the antique constructions. The delicate work in ataurique (technique of relief in plaster with vegetal motifs), is a sample of the architectural quality that reached the city. The spectacular fountain of the convent, is the largest sample of those still left in ancient Guatemala, was built during the eighteenth century and was partially restored in 1944. Another treasure of the Iglesaia de la Merced is the venerable image of Jesus Nazareno, which is a splendid example of colonial images. This building was built between 1543 and 1680, with a façade of elaborate baroque style, altarpiece type, where the imagery and ataurique predominate. It was one of the most important churches in Latin America at the time, however when the city moved the new Guatemala of the assumption, lost its degree of cathedral and became a parish, but until today is still called Cathedral by tradition. On the facade you can see high-relief sculptures representing the Twelve Apostles and four fathers of the church. It was built in the middle of the 16th century. Surrounded by a wall with battlements, its west façade is notable for its beautiful padded spiral columns. Once in the atrium, you can see the main façade of the temple showing 12 niches. In the interior, which is accessed by a side door, are preserved beautiful baroque altarpieces with mixtilíneas figures, all rolled in gold, as well as the chapel that preserves the body of the Holy Brother Pedro de San José de Betancur, who enjoys the devotion of Many Catholics from Guatemala and Central America. In the church is the Museum of the Holy Brother Peter, where are exhibited relics, clothing and objects he used. It is located in the back of the Metropolitan Cathedral, in the basement of the Plaza del Sanctum. There you can buy a variety of handicrafts that are produced throughout the country, such as ceramics, textiles, leather, wood, silverware, tinplate, etc., as well as producing basic consumption. Open every day from 6:00 to 18:00 hrs. Craft shops from 10:00 to 18:00 hrs. 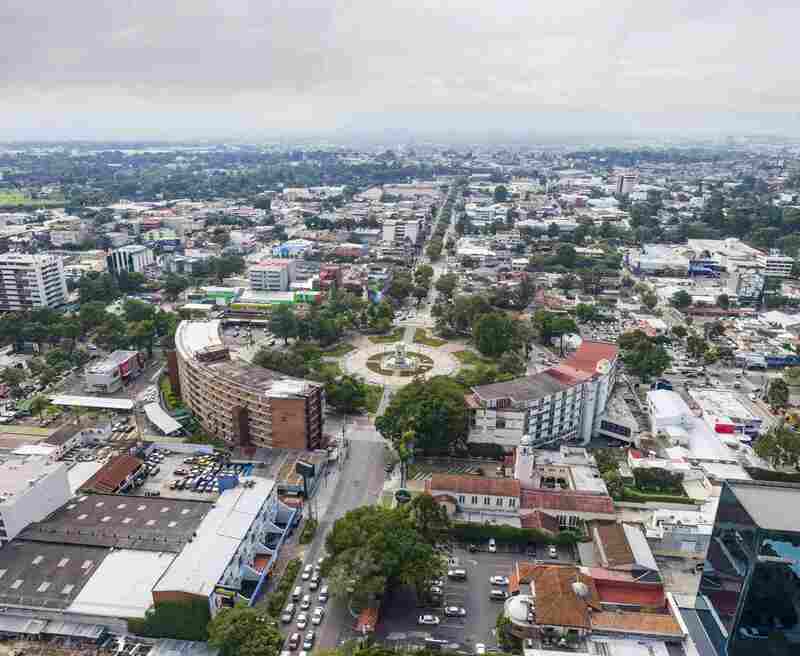 It is located on the Boulevard Juan Pablo II, which leads to the international Airport La Aurora, in zone 13 of the city of Guatemala. It has 51 commercial premises in which it is exhibited and sells a range of handicrafts elaborated in the different departments of the country as: textiles of different regions, leather, wood, ceramics, candles, paintings, antiques, jewellery in silver and jade, basketry and Clothing. The market also has artisan workshops, temporary exhibitions of handicrafts, special events, landscaped areas, public parking and security. Etymology: Hunahpú, which means bouquet of flowers. Great warrior or Cervatanero. Located between the departments of Escuintla, Sacatepéquez and Guatemala. Its peak is at 3.766 M.A.S.L. located in the municipality of Santa María de Jesús, about 9 kilometers from Antigua Guatemala. The volcano is a symmetrical cone of great beauty, covered by vegetation to its peak. This has not been active in historical times, still being the subject of discussion the currents of mud that on the night of September 1541, went down the slopes of the volcano and that joined an earthquake destroyed the second capital of Guatemala. This town is nestled among volcanoes, also surrounded by hills and mountains. This locality was capital of the kingdom for 14 years, during this period it suffered havoc because of the floods coming from the water volcano. Bordering the east with Antigua Guatemala and Santa María de Jesús Sacatepéquez; To the north with San Antonio Aguas Calientes and we have Chimaltenango; To the south with Palín and Escuintla Department of Escuintla; And to the west with San Miguel dueñas and San Juan Alotenango Sacatepéquez. Among the recommended sites to visit are the Church of Our Lady of Concepción, Aldea San Miguel Escobar and the Museum of memory of the volcano. It is located in the building that was home to the University of San Carlos de Borromeo, founded by the royal Certificate of Charles II on January 31, 1767 and was constituted the third oldest in America. It exhibits artistic treasures from the Colonial period, including an excellent painting by Pedro de Alvarado, conqueror of Guatemala. Timetable: Every day from 9:00 to 12:00 hrs. And from 14:00 to 18:00 hrs. In this museum we can find archaeology and art exhibitions of the Mayan culture, especially the ancient Mayan city of Kaminaljuyu. In this museum we can find pre-Columbian and colonial archaeology. We can appreciate different collections of art, such as Preshispánico, colonial and folklore. This museum is located on the Campus of the Francisco Marroquín University. In this museum we can find topics of anthropology and textile tradition, through collections of regional costumes of the different indigenous populations of the country. In this museum we can find sales of ceramics, handicrafts and books. The museum is within the university campus of the Universidad Francisco Marroquín. 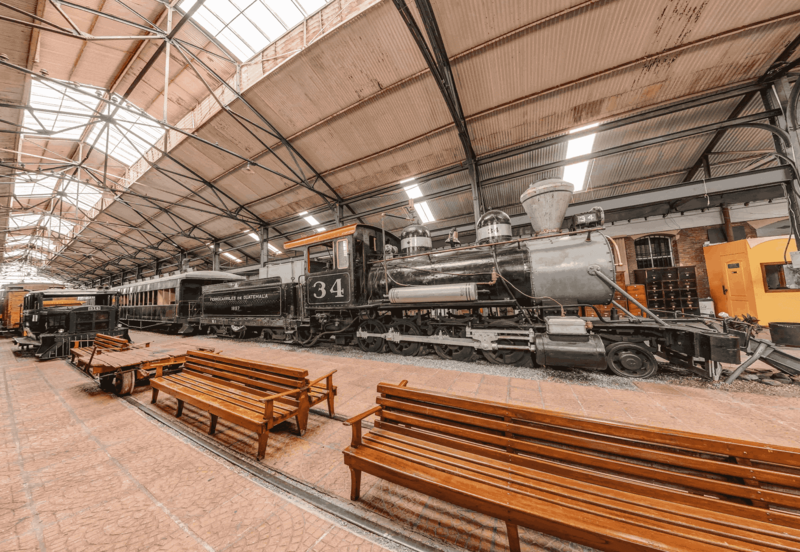 Open exhibition of locomotives and wagons, main hall with exhibition of railway articles, history of the railroad and its importance in the development of Guatemala. The museum is located in Zone 1. Ceramics in ancient Guatemala can be divided into glazed majolica and painted. The glaze was introduced in Spain by the Spanish-Moorish potters of Cordoba, Sevilla, Murcia and Mallorca. When discovering the art of Majolica, which covers the highlands of Guatemala, is introduced. The ceramics were used by the Spaniards and Creoles but not by the ethnic groups, their colors were green, orange and blue on the white. Currently, Antigua Guatemala is the main producer of Majolica, using as material the clay of El Tejar and white sand of the place.